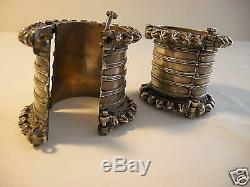 A wonderful pair of vintage, hinged silver bangles from Rajasthan or Gujrat. High silver content (assayed at over 93% pure). 2.5 inches tall by 2.8 inches outer diameter. Inner diameter is 2 inches, so would only fit on fairly thin wrists. 504 grams combined weight (15 troy ounces of pure silver). Beautiful and valuable tribal adornments. The item "Antique silver bracelet pair, tribal India, Rajasthan, Gujrat, vintage bangles" is in sale since Wednesday, April 25, 2012. This item is in the category "Jewelry & Watches\Vintage & Antique Jewelry\Vintage Ethnic/Regional/Tribal\Asian & East Indian".clayton" and is located in Long Beach, California. This item can be shipped to United States.